It’s the sort of racing that series organizers dream of, fans tune in for, and drivers lose sleep over: a head-to-head, winner-take-all duel for the championship. And when it all happens over the course of a 24-hour race, with each of the main contenders driving through the field to enter the fight? 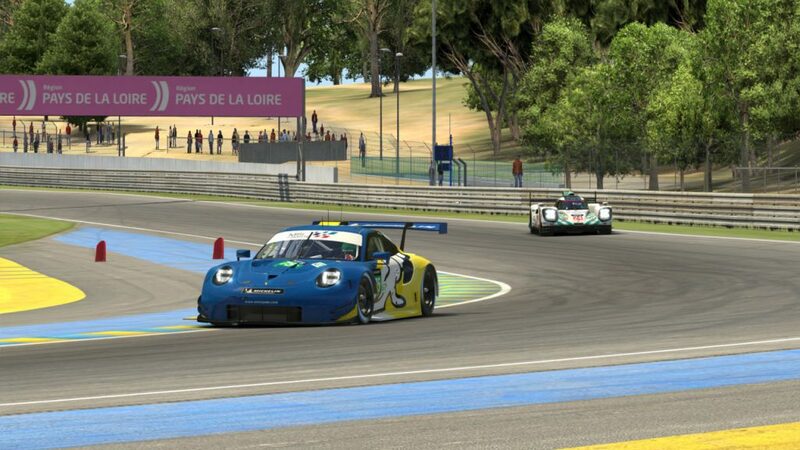 That made for even more magic in the NEO Endurance Series season finale last weekend at Le Mans. The points leader entering the race, MSI eSports, had a clear road to victory starting from the pole position, but they faced early challenges from several other top teams. Just five laps into the race, Carl Jansson from CoRe SimRacing overtook MSI’s Alejandro Sánchez for the race lead, and the two of them spend the first stint trading that position. Double stints were the way to go in the opening hours for MSI, CoRe, and a few other top-five teams including Williams JIM Esports #97 and Euphoria Drivex Racing, but a handful of teams opted to triple-stint their tires, which moved them up in the running order. 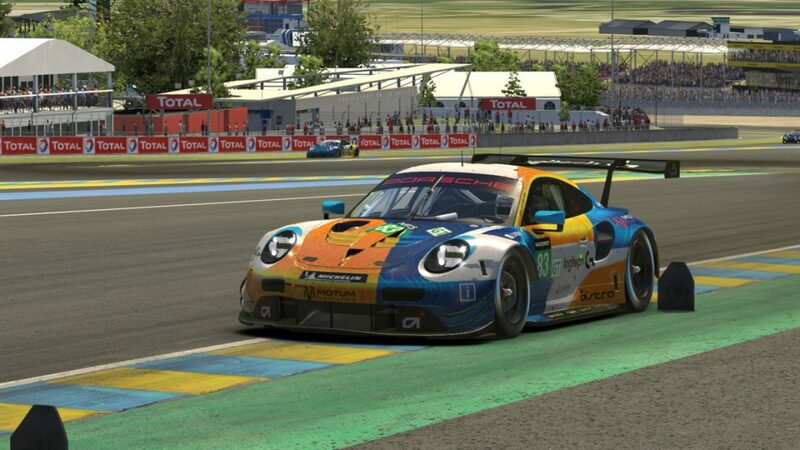 After two hours of racing, Thrustmaster Mivano Racing’s Anders Dahl held the lead until he was overtaken by Laurent Miskiewicz from Redface Racing — part of a speedy start to the French team’s home race at Le Mans. Critically, the championship lead also changed hands during the third hour as Simone Maria Marcenò from Logitech G Altus Esports continued the steady drive of teammate Yannick Lapchin from tenth on the grid to overtake MSI on lap 34. Marcenò eventually moved Altus all the way to the race lead, and with MSI continuing to run inside the top three, it seemed that a victory would be the only way for either team to take the class championship. However, that close title fight opened up on lap 77 when disaster struck for MSI. While running second, the #75 Porsche stopped on track with a technical failure, and after a slow three-minute tow back to the pits, the erstwhile points leaders found themselves back in fifteenth place with a long road ahead of them. Fortunately for them, they still had more than 19 hours to make that comeback, and their car was in perfect condition. MSI race through Tertre Rouge. A few other GT teams weren’t so lucky. In the first hour, a pair of mid-field teams were damaged and lost multiple laps making repairs. The Torque Freak Racing Porsche hit the outside armco entering the second Mulsanne chicane after a braking zone hip check from Porsche Basel by Sorg Rennsport eSports, and Torrent Motorsports was the victim of contact in the Porsche curves with the Apex Racing Team HPD. Near the two-hour mark, Team Buschfink Racing suffered race-ending damage when a P1 car tried a tight three-wide pass between two GTs and put the Birdies into the wall. Indeed, the field was thinning out in the opening hours, and it seemed like a question of when — not if — problems would strike other contenders. 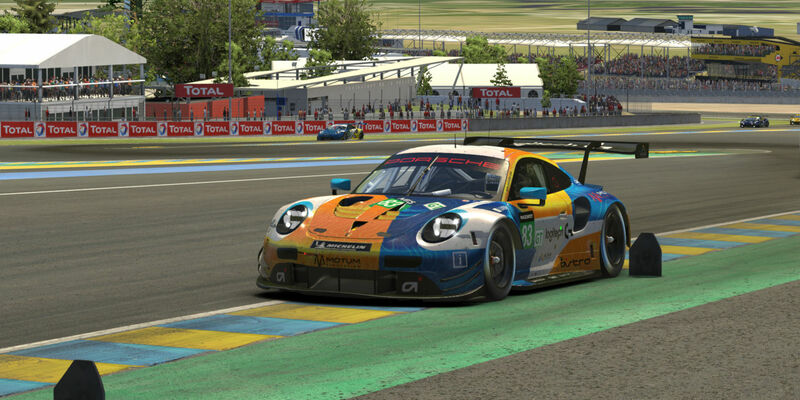 Sure enough, issues for CoRe, Euphoria, and TRITON Racing, who entered Le Mans third in points with an outside chance at the championship, dropped them out of the top five and opened up some other fights for top-eight spots in the standings. The Biela Racing Team EURONICS #85 car was on the outside looking in before the race, but Reto Hartmann’s drive into the top three by the six-hour mark gave them hope of earning an automatic invitation. Williams JIM Esports also had both of its entries at the front of the field, and despite going point-less in the first three races of the season, their #97 car had a realistic shot at a top-eight thanks to the double points in the finale. The Williams #96 team surrounded by faster-class traffic on the Mulsanne. 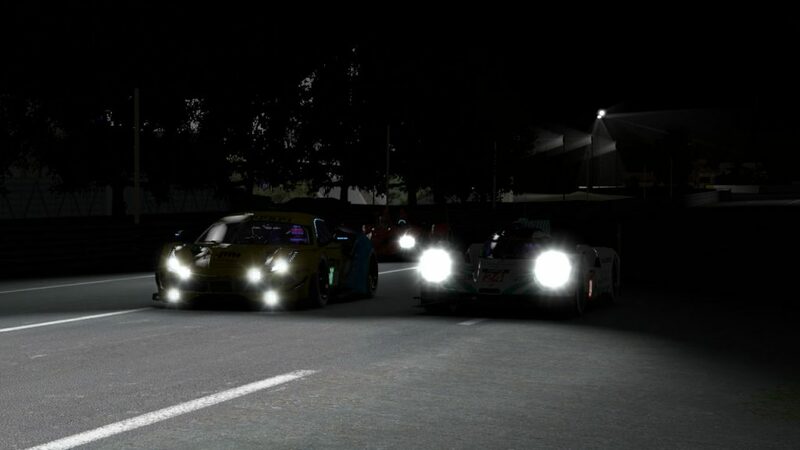 As the race moved into the night, Altus held the lead with Simon Feigl at the wheel, but SimRC.de’s Johannes Maiworm was in hot pursuit, and their battle eventually came to blows. A bobble entering the first Mulsanne chicane by Feigl led to an incidental bump from Maiworm, spinning the pair of Porsches into the gravel trap. Both cars suffered rear wing damage, but SimRC appeared to take the heaviest hit. Their time spent making repairs in the pits dropped them from second place back to sixth, while Altus continued in the lead. That wasn’t the only scare in Feigl’s quadruple stint, though. Toward the end, a similar technical problem to the one that bit MSI earlier in the race also caused the Altus car to stop on track, costing them two minutes in tow time and two positions as the Biela #85 and Williams #96 cars got past them. The sunrise shed a bit more light on where the contenders stood in the race and in the standings. 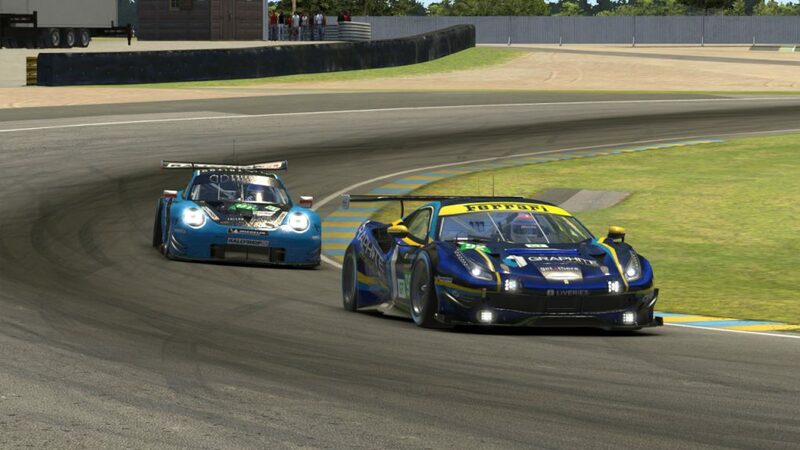 Another comeback drive by Marcenò helped him reclaim those lost positions and put Altus back in the lead, while Marc Perez also recovered the lost time for MSI, putting them up to second place and just 20 seconds behind with eight hours to go. From there, the two finished this enduro in sprint race fashion, with Altus generally holding the lead but MSI steadily cutting into their advantage and briefly taking the top spot during each cycle of pit stops. MSI leads Altus with one hour to go. Inside the final hour, MSI was just seconds ahead but had to take more fuel in their final stop. Those few extra liters made the difference, as Altus emerged from the pits with an eight-second lead with 38 minutes to go. Each team encountered traffic in the closing laps, including the tenth-place battle between Graphite Racing and TRITON, but Marcenò incredible pace and consistency on the warming afternoon track was enough. Just five seconds ahead at the checkered flag, Altus came out on top of a titanic battle between two NEO rookie-turned-rockstar teams to earn the race win — their fourth of the season — and the class championship. For MSI, it was a comeback that came up just short, and while they could surely have plenty of “what if”s to ponder about this race, they instead looked to the positives of the race and the season. “The pole position achieved by Alejandro Sánchez in the qualifying session reinforced the ability of MSI to get the victory and the title,” they noted in their post-race recap, crediting “the great rhythm and strategy of Altus” as a difference-maker in the race results. MSI did hang on to second in points, while third place in the standings went to another of the Le Mans top performers — Redface, which earned their first podium of the season due to a damage-free and fast-paced Ferrari drive by Miskiewicz, Bruno Fontalba, Benjamin Gonzalez, and Joel Guez. 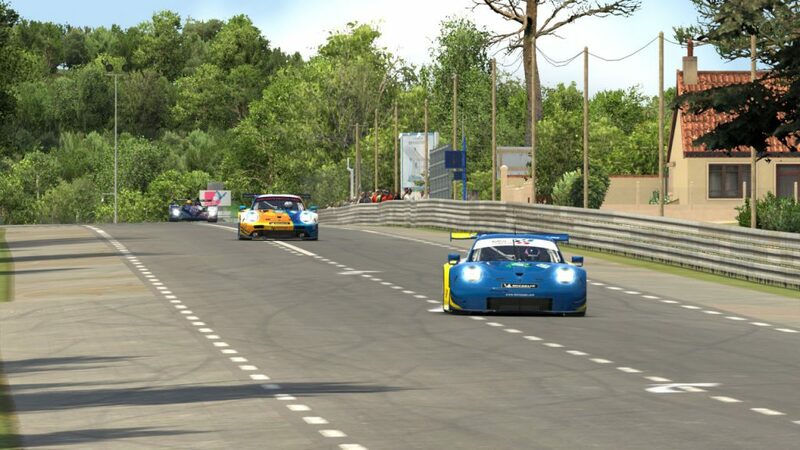 Redface run inside the top three in the final laps at Le Mans. The Biela #85 team reached the checkered flag in fourth place, which put them eighth in points and with the final automatic invitation to season six. Despite their mid-race contact with Altus, SimRC was able to finish fifth in the race, which also put them fifth in points. The SRN Motorsports #74 team treated Le Mans a bit like a ladder, climbing up a rung or two when the teams ahead of them dropped out. The last such position they gained was over the heavily damaged Williams #96 car with just two laps to go. That put them up to sixth place — their best NEO result since a sixth in the Aston Martin GT1 car at Le Mans two years ago. The pair of Williams Ferraris finished just behind them. The #97 car was seventh, narrowly missing a top-eight standings finish by just two points. The #96 car fell out of a podium position after contact with a P1 car, and they spend the final three hours limping home to an eventual eighth-place finish. Sorg came home in ninth while the DGFX Racing League GT Pro champions from Graphite Racing overcame an early 60-second penalty for late driver registrations to finish tenth in their NEO debut. A confessed “too many mistakes” by TRITON left their car damaged and in eleventh place, but they held onto fourth in the standings by virtue of their strong runs early in the season. Graphite and TRITON fight for a top-ten position. ZENNITH eSport also had a problem-filled race, and they crossed the finish line in twelfth. S2V Racing flirted with the top ten early in the race but could manage only thirteenth, although they held onto sixth in points. After their early incidents, Torque Freak and Torrent soldiered on until the end, finishing fourteenth and fifteenth, respectively. 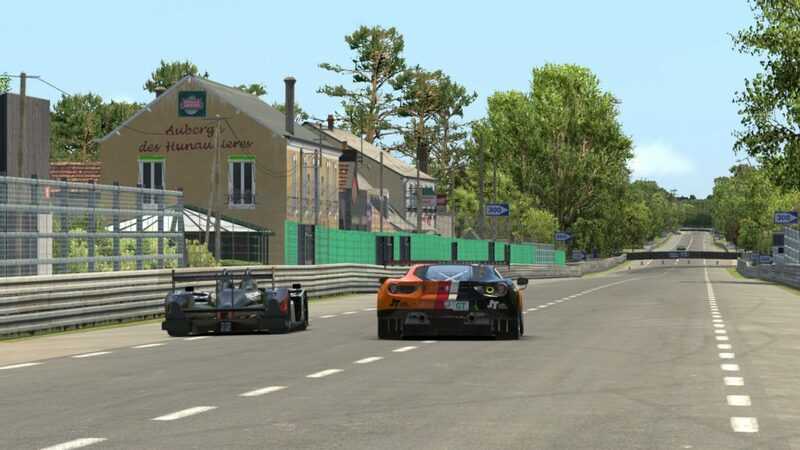 A crash with six hours to go claimed the Biela Racing Team EURONICS #84 Porsche, leaving them in sixteenth. The final GT entrant classified at the finish was Trick Simsports, the Oceanic Endurance Champion GT titlist, in seventeenth. Despite a promising third-place start, Euphoria dropped out around the 16-hour mark, putting them in eighteenth. CoRe retired early, and as a result, the two-time winners this season failed to finish in the top eight overall. Their fellow Ford competitors from Mivano also dropped out but ended up seventh in the final standings. Buschfink was twenty-first and last in the GT results. Perhaps it was only fitting that the most competitive season ever in NEO’s GT class ended with one of the closest fights for a win and a championship in series history. It was a season that saw new names like Marcenò and MSI become well-known and revered for their driving, in the process adding their names to the NEO history books. The drama they generated all season, from fighting through the field to fighting for wins, was the sort of excitement that organizers and fans dream of. And they’re the sorts of stressful situations that may make NEO GT teams glad to have an off-season ahead of them.